A great shot of a Red Diamond(Mexican Red)rattlesnake sent in by Jim Pankey. Jim took this photo while on a picture taking hike in Simpson Park near Hemet, California. He had stopped to photograph some flowers when he heard the sound of the rattle. Luckily, the Red is more laid-back and not so prone to strike as its cousin, the Western Diamondback, so the day ended with the warning rattle, this photo, and a shaken but unbitten lady. 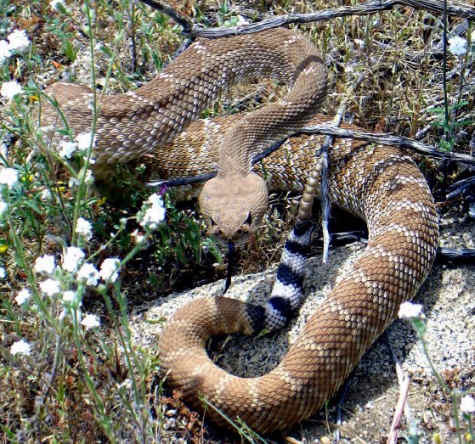 Pankey allowed it to move under a rock a dozen feet from the trail and notified hikers that snakes were out.